Time to change it up a bit. I took a different job this week, one which a family member termed a “demotion”, but by choice. I was tired of my life. Tired of sitting still all day. Tired of the grind, the relentless wheel of need that has no end. I knew I was getting this way months ago, but I didn’t do anything about it. I could have. I was going to. This week. I quit my major part-time job. Well actually not really. Another position came up, outreach, and someone asked me to apply. Thank you someone. You know how it is, you don’t realize how badly you were doing until you look back. I realize now that I was coasting, coasting while doing a few other amazing things. But even those other amazing things couldn’t compete with the grind. So here I sit in a new office, in a trailer, at a local First Nation Office. The people are amazing and the office is awesome. Tomorrow I hang out with teens at a unique high school for those who can’t handle the norm. Wednesday I will gratefully sit back in my counseling chair to help out for a day because Thursday is my day – I’ll find something to do. Friday I’m at the Laser Clinic and private practice, after seeing my two babies of course. Life just got mixed up. I am a big believer in mixing stuff up. I have an entire life of variety and all I had to do to get that was to give up any hope of dying with a nice boat. Others do it better but I have a habit of getting bored, just when things get secure. My wife tells everyone I have ADHD but I’m the counselor and I’m firmly convinced that I don’t want that diagnosis. But then again, I’m bored now so let’s move on. Change is good. It reminds us that we are alive. Change brings back our creative passions and exposes us to experiences. When this happens I like to call that “living”. Sometimes I can go weeks without really living, just getting by. I have no idea if I am going to like this decision, but there is no turning back without repercussions. I like that, in theory. 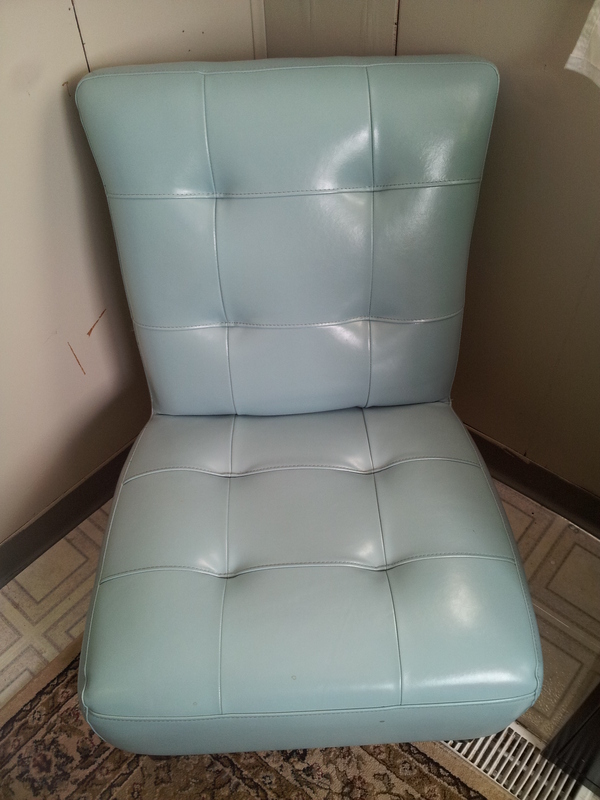 The chairs in this little corner office are very retro cool, and I have no idea what color they are. In my ear I can hear several creative females in my life-giving me “the look” before condescending to tell me the color is sea-foam hippy sweat or some such. They remind me of the talking chairs in Alice in Wonderland or The Beauty and the Beast or Sons of Anarchy, I get them mixed up. It may all seem strange but soon, like anything and anyone, it becomes normal, regular. I’ll worry about that some other time. Today I’m just happy that it’s sunny out, I’m off to meet a Chief, and my sea-foam hippy chair mixes nicely with the 1978 carpet and the trailer paneling. I’m content. Congratulation on having the courage (I was going to say balls but decided to be lady like) to change things up/down whatever…when a person spends as much time at work as most people do there is nothing worse than bored. It sounds like you might face a challenge or two, that can be much more rewarding than bored. Look forward to hearing about it. May God bless you on your new adventure!